The first of four Fred Scott singing Westerns produced by C.C. 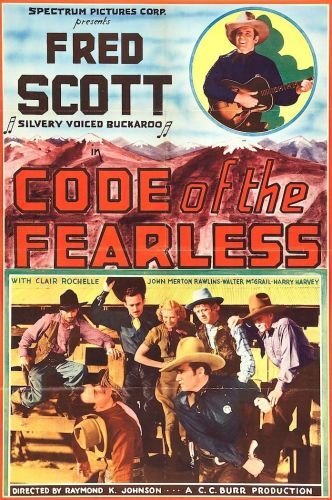 Burr, Code of the Fearless was like all thirteen Scott vehicles released by poverty row company Spectrum Pictures. Scott, a former baritone with the San Francisco Opera, played a Texas Ranger infiltrating the feared Skull Mesa Gang by pretending to be an outlaw himself. Unfortunately, the lawman is so convincing that he even seems to have fooled Ranger Captain Walter McGrail, who accuses him of fraternizing with the enemy. Scott's only defender is pretty Jean Morrison (Claire Rochelle) but even she is dumbfounded when he joins the Skull Mesa bandits at their secret hideout. It is all a ruse, of course, and Captain Rawlins and his Rangers arrive just in time to round up the entire gang. The story had been told many times before (and would be many times again); the only difference here is that Scott took time out to warble such ditties as Here's Romance and Gonna Ride, both by Lew Porter and Johnny Lange. Popular sidekick Al St. John, who had supported Scott in seven previous Westerns, was replaced here by former burlesque comic Harry Harvey.